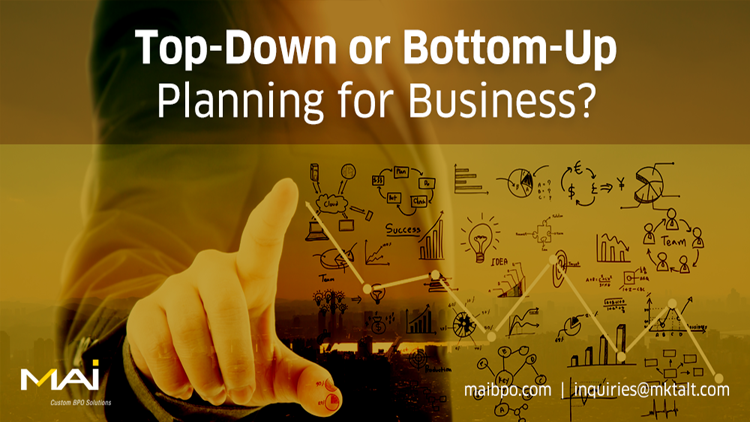 Top-Down or Bottom-Up Planning: What Works Best for Your Business? Business planning is one of the most significant aspects of a successful enterprise. Two of the most common planning approaches are top-down planning and bottom-up planning methods. Although these two models represent two contrasting operational strategies, they both share similarities in how a company identifies its principal goals. On a very basic level, the top-down approach seeks to go from the general to the specifics, while the bottom-up approach works its way from the specifics to the general. Let’s explore both approaches to gain an understanding of how different they are from each other and how suitable they are to specific business areas. Top-down planning traditionally involves defining organizational goals on a high level and breaking them down into specific objectives which are then addressed in phases. As the name indicates, top-down planning is an approach that aims at moving gradually from the top to the lower levels of a given hierarchy. Consider the case of financial forecasting for a retail business. Adopting a top-down approach in this scenario would mean a first step that involves assessing the market as a whole, gauging relevant sales trends based on the current market size and segmenting the market in terms of readiness to buy your product or service. Based on the trends, the strengths and weaknesses of the organization’s core areas are assessed. These insights are then used to help position and promote the company’s products while additional strategies are targeted at expanding the product and/or service offering. The same approach, when explained in terms of organizational hierarchy, requires senior management to broadly elucidate plans which are then passed down for execution among staff members. Quite the opposite, bottom-up planning works toward setting a plan at the most detailed level of classification. A bottom-up analysis focuses specifically on the product or service you are trying to sell and gathers details around it such as production capacity, department-specific expenses, and finally the market trends, in order to make an accurate sales projection. In this method, where planning is done at a store level rather than from a market perspective, it is easier to determine store replenishment requirements based on future customer demand, region specific geographic sales and demographics. Additionally, it also seeks to provide more flexibility to manage off-season and promotional demand patterns appropriately. Top-down planning seems to be best suited for startups that are looking to gain some quick insights for long term results. This approach gives a broader picture of revenue potential for companies. It can help identify accurate sales patterns and evaluate markets in terms of their size and potential right, thereby allowing companies to create more usable theories for strategizing business models. The bottom-up planning approach can prove useful in industries where projects tend to involve new challenges that require innovative solutions. Since it provides higher visibility due to its focus on specific details, this approach creates product awareness among users as well as business owners very early on. More realistic financial projections are also possible with this approach. This essentially translates into better allocation of resources to specific items rather than whole. Top-down and bottom-up planning techniques each have their own pros and cons. Determining the best model will ultimately depend on the nature of the specific business and available resources. To make the best use of both approaches, it would be ideal to use both analytic processes in combination with one another to suit specific needs. As a business owner, you must decide how much control you want to have over the implementation of strategies to meet your most important goals.